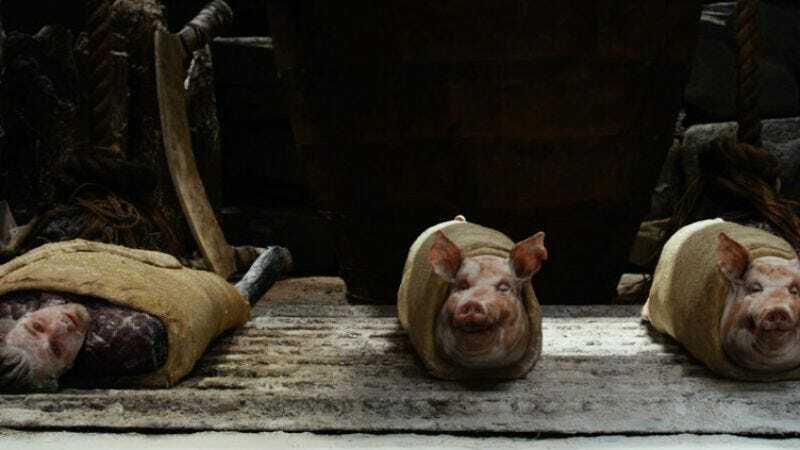 Caption Contest: Pigs in a blanket in Jack The Giant Slayer? In the interest of science, creativity, and the science of creativity, we're posting a film or TV still every week, and we're going to ask you to come up with a clever caption. Whoever's caption gets the most likes will win some kind of nonsense prize from The A.V. Club office, most likely a Simpsons toy of some sort. The winner of the last contest, featuring Bruce Willis and friends in the stinky Die Hard movie, was ShrikeTheAvatar, who offered: "That meteor is actually the perfect metaphor for the quality of this franchise over time." Well done, Shrike. We'll be in touch. "Choose life. Choose a job. Choose one of these three delicious pork snacks."